Variations in pigments from batch-to-batch as well as differences in manufacturing conditions in the acrylic sheet and the thermoforming process cause small differences in color in a specific final products and even location on the product surface. For example, acrylic sheet is heated and stretched into the shape of the final product. It is reinforced with fiber glass, which is colored. The sheet becomes thinner in the bottom of a bathtub, and becomes translucent. The “shadow” created by the color of the reinforcement can affect the color observed on the tub surface, since the sheet is normally translucent. Also, as in carpet manufacturing, the sheet production process creates color differences. These differences can often be detected visually. Therefore, in order to get the “best’ color match, toning of the base coat(s) used for the repair may be desirable. Multi-Tech Products offers toners and toner kits for this purpose. Success requires practice and developing the skills to recognize color shades and the requirements for achieving the right color shift. The simplest adjustment is lightening or darkening by using the white or black toner supplied with standard repair kits. MTP offers a practical range of toners based on our different repair systems and refinish coatings. The key to successful color matching and adjusting is visually seeing the particular color shades in the surface, and by matching the coating with the available toners on hand to that surface. Knowing the right toner that makes up a color is a good start and useful information. Our guide below gives you the basic colors within a color range (or family of colors). The guide is also available in PDF format to downloand or print by Clicking Here. An important factor is seeing what the surface color needs that is being matched, and adding the missing color to the mixture. This is done by applying the attempted matched mixture to the surface, comparing the visual shades, and adjusting with toners. This is a process and will take several attempts to get an acceptable match. Please Note: To make color matching simple, most common bath ware colors can be matched using a white base, black (brown black), yellow oxide, and red oxide toners. These three toners are an essential part of any surface repair kit and essential for White, Biscuit, Almond-Bone, Grey and Rose color matching and adjustments. This rule and techniques apply to most other surfaces, coatings and industries as well. We carry three different kits based on the skill and degree of color matching levels. Primary Toner Kit: (Best starter kit) Black, Red Oxide, Yellow Oxide, Green, and Blue. Secondary Toner Kit: (Advanced color matching) Chrome Yellow, Raspberry, Orange, Violet & Blue/Black toners. Complete Toner Kit: All colors and separate toners as well. Surprisingly to many, all colors can be defined numerically. 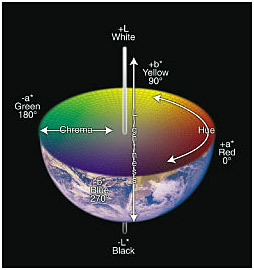 Color technologists have created the science which uses L “a” and “b” values for the four primary colors and white or black. L is a number that indicates the relative amount of white or black and is the height axis of a three-dimensional graph. The “a” value indicates the ratio of red (a+) and green (a-). The “b” value represents the ratio of blue (b-) and yellow (b+). These three numbers will locate a specific color in the graph space as shown below. Color values are measured using special instruments, colorimeters or spectrophotometers. Colorimeters were the pioneers of color measuring instruments. Colorimeters view a sample through at least three filters, measuring the quantity of light reflected from the sample as it passes through each of the filters. The filters were originally designed to mimic the response of the red, blue and green cones of the eye as closely as possible. This, at first glance, seems to have merit, since it attempted to imitate the eye of the standard observer. However, an important deficiency of colorimeters is they cannot separate the pure color from the appearance of an object. Additionally, a colorimeter is unable to detect if an object’s color will appear differently under different light sources. Therefore, colorimeters have limited capability when compared with current technology. Geometric Spectrophotometers are the latest technology tools. 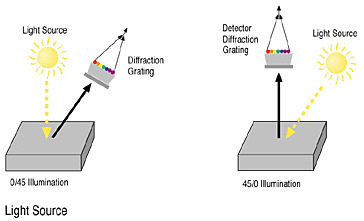 0/45° geometry spectrophotometers illuminate the sample at an angle of 90° while the detector views the sample at a 45° angle. 45/0° geometry illuminates the sample with a beam striking the sample at an angle of 45° while the detector views the sample at an angle of 90°. Many color technologists report that 0/45° or 45/0° geometry spectrophotometric and colorimetric data closely simulates the visual experience. This is advantageous when seeking to match or evaluate color samples thanks to the reported agreement with visual assessments. A distinct disadvantage to this geometry, however, is the inability to examine transparent and translucent samples. The following table provides tips and guidelines for adjusting base colors using black, yellow oxide, chrome yellow, red, red oxide, blue, green, raspberry, orange, and brown toners supplied by Multi-Tech Products. Refer to the current catalog for a complete listing of available toners.